Fore! 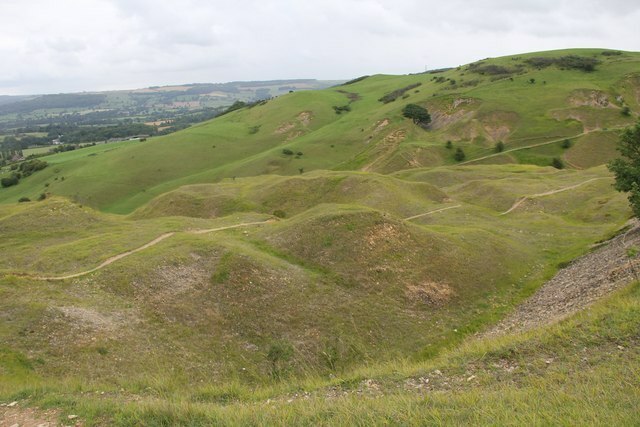 The day before our Staple Hill event (Saturday 13) was a chance to run on Cleeve Hill on the Cotswolds, where runners weaved around the fairways during a golf competition being held at the same time. Several QO took in the action, perched up high with commanding views across to Gloucester and the Welsh mountains beyond. With a spectacularly located golf course and the golf competition taking place, there were 18 out of bounds strips to avoid (see Routegadget link here) - as well as any airborne golf balls. After watching the Masters TV coverage later that day, some parallels between the two sports became apparent, just with flags instead of kites, fairways for bridleways and bunkers not depressions. Both sports featuring a staggered field, everybody taking different angles of approach, sometimes overshooting their targets and getting stuck in the rough, probably due to lapses in concentration. And so ruining good runs or rounds with just one bad hole/control before blaming the pitch/map during a moan in the club house/car park. Ollie and Annabelle Lewis had impressive runs on Orange, beating a several older runners, including M21s and W21s and finishing about halfway down the leaderboard. Steve Robertson was a third of the way down the finishers on Blue, just 12 minutes behind the winner. Your correspondent? Teed off decisively, double-bogeyed on the first tricky control but recovered well.